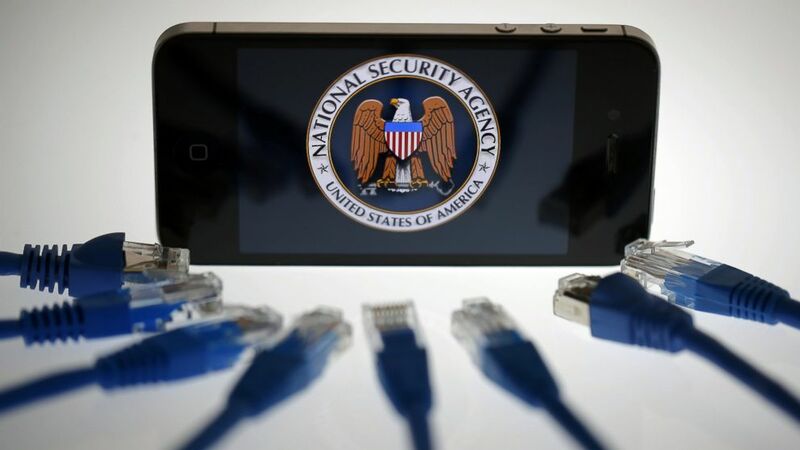 The logo of the National Security Agency is displayed on an iPhone in Berlin, June 7, 2013. Newly leaked documents from the National Security Agency highlight Dropout Jeep, a piece of software that could target one of the country's most popular devices -- the iPhone. According to documents published by the German news website Spiegel Online and dated Oct. 1, 2008, Dropout Jeep would give the NSA the ability to retrieve contact information, read through text messages, listen to voicemails and even turn on the iPhone camera and microphone. The document goes on to say that while Drop Jeep was currently limited to installation through "close access methods," the NSA would research ways to install the program remotely in future versions. Security researcher Jacob Appelbaum presented the documents at the 30th Chaos Communication Congress in Hamburg, Germany. In addition to talking about Drop Jeep, he mentioned other leaked documents that highlighted other NSA spyware, and said that every attempt to implant such spyware on iOS devices would always succeed. Apple denies any involvement in the spyware program. "Apple has never worked with the NSA to create a backdoor in any of our products, including the iPhone," said the company in a statement to ABC News. "We care deeply about our customers' privacy and security. Whenever we hear about attempts to undermine Apple's industry-leading security, we thoroughly investigate and take appropriate steps to protect our customers." Many of these documents date back to 2008, when the iPhone 3G was the newest smartphone available, so it's not clear whether Dropout Jeep could affect modern phones. Billy Lau, a security researcher at Georgia Tech, said that while Apple has beefed up its security since 2008, it's not invulnerable. "The Evasion jailbreak of iOS 7 implies that part of the OS has been exploited and has some deep security implications," he told ABC News. Bradley Shear, a lawyer who specializes in Internet privacy, said that the NSA spyware may be out of Apple's control, as well as out of other companies' control such as Google and Microsoft. "I don't think any of the tech companies would knowingly allow [for NSA tapping]," he said. "But the NSA has a know-how to do things the tech community may not be aware of."